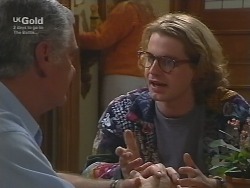 Hannah suggesting to Philip that they should make a casserole to welcome the Wilkinsons to Ramsay Street. Marlene trying to persuade Brett to carry on helping Darren sort out his problems. 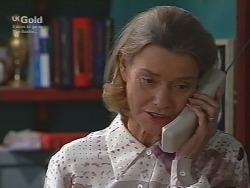 Helen telling Lou that she should ring Madge to tell her that Harold is alive and there in Erinsborough. It's evening- time and Ruth opens the front door to Hannah, who has the casserole. She thanks her and invites her to join her and Lance to eat it. She heads to the kitchen and Lance heads into the lounge room to find some plates. Hannah asks Lance if he's thought of a name for the puppy. Lance, though, says he hasn't had time to do *anything*. He then asks Hannah if she can do him a favour: go to the kitchen and keep his mum distracted while he makes a ‘phone call. He finds the ‘phone isn't connected, though, and looks annoyed. Hannah says she'll go and get some dog food from home. HELEN: Yes, that was Madge: she's coming down. MARLENE (uncertainly): Now, this is Harold's wife? HELEN: Yes, that's right. She and Lou and Harold went to High School together. As a matter of fact, before Madge agreed to marry Harold, there was some doubt as to who she *would* marry! MARLENE (laughs): Oh, you're pulling my leg! HELEN (shaking her head): Lou was engaged to her for a while! The ‘phone rings and Lou goes to answer it. 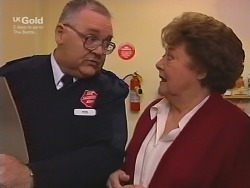 Helen comes on and tells him that Madge is coming down and she thought he might like to meet her at the airport. She reads out the flight details, adding that Madge is very nervous about the whole thing. Lou comments that he *bets* she is. HELEN (tersely): His name's *Harold*. There's no such *person* as ‘Ted'. Lance is unpacking. Ruth tells him that she knows it's boring, but the sooner they get it all done, the sooner it'll feel like home. Lance picks up a box and takes it into the kitchen just as someone knocks on the front door. Ruth opens it to Hannah, who has dog food. Lance takes it and says they'll have to find something to put it in now. Hannah tells him that they've got some spare bowls at home. Lance picks up his protective skating gear and heads to the front door. Hannah asks what the gear's for, but Lance just retorts that he'll tell her outside. Toadie and Billy are planning a game of street cricket, discussing the rules as they fetch a ball from No. 28's garage. Across the street, Lance is putting his rollerblades on. Hannah asks what they're for, but Lance just tells her that there's something he has to do, and he asks Hannah to cover for him. He gets up and stakes off down the road. Toadie and Billy join Hannah and ask her where Lance is off to. Hannah shrugs that he wouldn't say. Billy invites her to join in the game of street cricket. Hannah, however, points out that it's too dark to even see what they're doing. That doesn't stop Billy bowling a long no- ball to Toadie – the ball careering off way down the road! Brett is sitting at a table with Lou, telling him that he's only trying to make things work – and Lou is the one Darren seems to be having the most trouble with. Lou explains that he really only knew Darren for a couple of weeks before he went up to Lauren's – and that's when he and Cheryl were separating; and Darren has been aggressive and offensive ever since he got back. He adds that he's tried to be mates with him and get him work at the bar; all the compromise has been on *his* side and he's had a gutful. 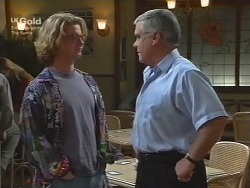 Brett suggests that he could talk Darren into selling Lou his share of the pub. Lou, however, says he doesn't think Brett stands a snowball's chance in hell of turning Darren around. LUKE: I'm even *more* nervous about this little talk of mine this morning. SUSAN: Don't be. Just talk to them the way you tell *anyone* what you went through. LUKE: What if they're not interested? SUSAN: They will be – you'll see. LOU: So – *I'm* meeting Madge at the airport. MARLENE: And *I* have to get Ted to Chez Chez for lunch. HELEN: That's right – and when we get them together, hopefully ‘Ted' will recognise Madge and his memory will come flooding back. MARLENE: Yeah, but what if he *doesn't* recognise her? HELEN: Oh, well, we'll think about that later. What you have to do is concentrate on getting Harold to lunch. 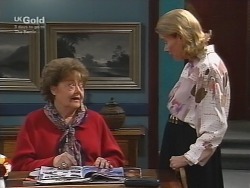 Marlene says she's going to volunteer at the op shop, so it'll give her all the morning to talk him into it. There's suddenly a knock on the front door and Lou goes and opens it to Ruth and Lance. Ruth explains that she thought they should bring back the casserole dish from last night. She adds that the casserole was delicious! 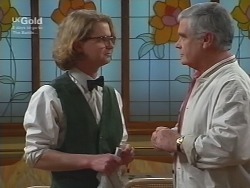 LOU: Well, this is going to be quite something! HELEN: Can you imagine? By the end of the day, Harold and Madge are going to be together again! Lou walks into the bar. Brett is working and he comments that he thought Lou was going to the airport. Lou says he is – but he forgot to pick up some cash: the car's almost out of petrol. Brett then suggests that they have a bit of a family get- together tonight at Marlene's: Darren's going to be there... Lou sighs that he doesn't know. Brett points out that he thought families were meant to stick together; and *he's* filling in for Lou while he goes to the airport. Lou gives in, adding that he Brett should use his powers for good rather than evil! The students in the class quickly lose interest and start talking to each other, ignoring Luke. Susan asks him to speak up. He tells the class hesitantly that it's always hard talking about personal things and he guesses this is no exception. 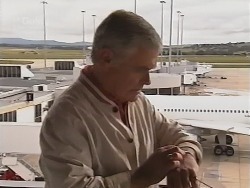 Lou is looking at his watch as a Qantas flight touches down. He then turns and looks at the flight board, which confirms that Madge's ‘plane has landed. ‘TED': Oh, lunch! Yes, yes, of course – all in good time. Lots to do yet! MARLENE: I know a nice little place where we could have a bite to eat... together. ‘TED': That would be nice, but I'm afraid I've brought me own sandwiches. ‘TED' (realises): Ah. Yes, yes, of course. All right, then. ‘TED': Tell you what: you go out and buy your sandwiches and then we can sit in the sunshine and have our lunches together. Now, that would be *much* nicer. 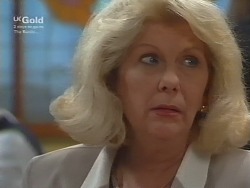 A look of annoyance crosses Marlene's face! LUKE: It's *Non*- Hodgkin's Lymphoma. TOADIE: Yeah, I know. So what's Hodgkin's Lymphoma? And who's Hodgkins anyway? Is he a real dude or not?! TOADIE: You're in remission, right? TOADIE: So what happens if you went for your last test and they said you weren't? What would you have done? LUKE: Panicked for a while, maybe. Got mad. Um... thought about how unfair it was. There's no way you can come to terms with something like this at my age – or at *any* age, really. TOADIE: Yeah... I thought a lot about it when my pop died. I mean, he had sixty years up on you, but, you know, I was still pretty upset. LUKE: Yeah, well, that's it, isn't it: why should you lose anyone you love? BILLY (chipping in): But you must've worked something out, you know, about how to handle it. Just in case. LUKE: Yeah, I was trying to, but my feelings changed every day. I kept trying to forget I was sick, but I couldn't. And then you meet some people who are really accepting of their own illness. Who knows? TOADIE: So you're OK now? LUKE (grins): Well, the hair's grown back! [There's a ripple of laughter from the students] And life's pretty much back to how it was – back to the old habits. I still make an effort to remember how I felt, though, and the promises I made to myself – and I'm not going to waste any time. See, that's what I learned is just do something that's important to *me*. Several hands go up, the class suddenly very much interested. Luke looks relieved. MADGE: Have you actually *seen* Harold? LOU: Yes. I mean there can't be *two* people unlucky enough to look like that! MADGE (smiles): Oh stop it! LOU (chuckles): Sorry – old habits die hard. MADGE: You know, it took me so long to accept the fact that I'd never see him again. Now I can't believe I'm actually *going* to. LOU: Yes, I know. When I saw him it was like taking a step back in time. MADGE: A bit of a shock to the system, I can tell you. I mean, there I am, nicely settled up in Queensland; I'm even used to being called ‘gran' these days. Now I've just got the feeling I don't know where I should be. LOU: Well, you're amongst old friends now. That's all you've got to worry about. Come on, let's get your bags and get you home to Ramsay Street. ‘TED': Dear oh dear. Lunch! You've been on about lunch all day! Look, if it's that important to you, off you go. You don't have to stay – you're a volunteer, as it were! Marlene tells him that he must think her pestering is very strange, but she's a very lonely person; to have a meal or even buy a sandwich alone is heartbreaking – she just thought he might have time to spare to have a bite to eat with her. 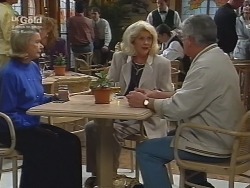 ‘Ted' gives in, but tells Marlene that if she wants his company for lunch, they're going to have to go somewhere where he can take his sandwiches. Marlene makes to leave, but ‘Ted' tells her that they have to finish what they're doing there first – and at that moment the shop bell rings as another customer comes in. 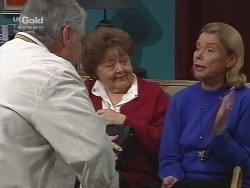 A look of frustration crosses Marlene's face. MADGE: Maybe he's found out I'm going to be here and he doesn't want to see me? MADGE: I don't think I can manage this. All the way down on the ‘plane I was looking forward to it. Now I'm not so sure. The bar doors open suddenly and everyone looks round. It's not Marlene and Harold, though. Madge sits there with a nervous expression on her face.